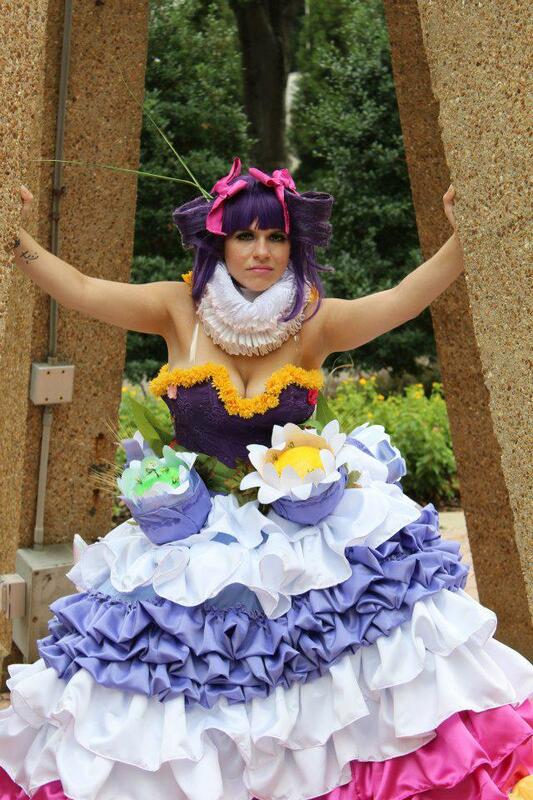 Editor Note: Cute Classy Cosplay was chosen as the Wild Card Team at Anime St. Louis to represent the Eastern region of The United States at the 2014 U.S. World Cosplay Summit Finals at Anime Central 2014. 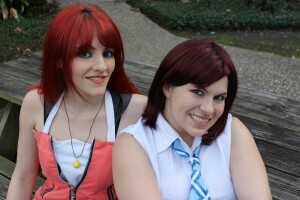 Cute Cosplay Cosplay is comprised of two Louisiana Cosplayers SanctuaryMemories and Oolala Cosplay. The winner of this competition will travel to Japan for the International World Cosplay Summit and compete for America against representatives of the other countries involved in the WCS. SM– My name is Michelle! I’m 25 years old, and I’ve been cosplaying for about fourteen years. I’m from New Orleans, Louisiana. I go by the cosplay alias “SanctuaryMemories” and love everything CLAMP, lime green, vintage, chocolate, and sleeping! OO– My name is Brigette. I go by the name “OoLaLa” in the cosplay community, which is also my on air name for Lafayette’s Rock 93.7 FM radio station, where I work as a DJ/radio announcer. I am a lover of video games, anime, rock music, and Magic the Gathering. I’ve been cosplaying for about 10 years. I’m a model for Charisma +2 Models and Talent and I’ve also voiced minor bit-parts for the North American releases of a few anime titles for FUNimation. I also really love chocolate and coffee. 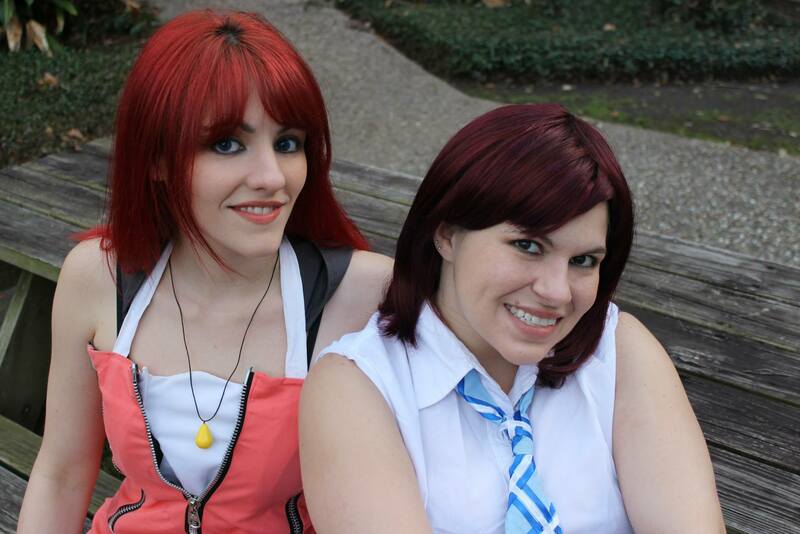 SM- When I was in high school, a friend told me about a con coming to our hometown, which was a first for Louisiana. I asked her what people do at such things, and among the things she told me she mentioned “cosplaying.” I didn’t know how to sew back then, but I definitely threw some good ‘ole closet cosplay together. OO- I was working at a videogame store, and some people came in and recruited me to be a mascot/cosplay model for their new convention, “Mechacon,” that was starting in my hometown of Lafayette, La. I worked for them for 7 years, during which I learned a lot about cosplay and started making costumes of my own. SM– It’s lame for being so simple, but my Haruno Sakura from Naruto Shippuden is my favorite. I’ve had that one since 2006, so it’s the oldest of my costumes I still own from way back when. I guess I really like my June May too. OO- KOS-MOS from Xenosaga episode I.
SM– Mostly, it’s based on what Brigette and I are really attracted to at the moment, or what groups we’re invited to join in. OO– I visit the fortune teller in Zelda… just kidding! Ummm… a combination of things really. If another cosplayer or cosplay group invites me to do a series… I’ll pick the one that i ﬁt the personality of… or one where I really like the costume. But if I’m picking one to do solo… I have a list of characters that I admire and love what their wearing. Usually heroic women from games or stoic automaton-ish women. I also like picking stuff that is a challenge to create. SM– I’ve always loved creating things, so this is pretty much the ultimate in creation every time. I get to work with so many different things and learn a lot of new skills. I also love to be able to embody so many different characters I admire. Meeting people is also a big plus for me, because I love all of the friends cosplaying has brought into my life. OO– It feeds my inner art school graduate… It’s a creative outlet, and it gives me the chance to embody the characters I love. It also feels so amazing when people see me as their favorite character and come to say hello. It’s like I get to be a part of a fantasy world together with so many wonderful people who share a common love of video games and anime. SM– I always say it’s Sailor V because that’s the costume I’ve wanted to make since I first started cosplaying and I just keep putting it off (she’s my favorite character! I have to do it right)! But, I also want to do ALL the costumes Sakura wears in Naruto, and I’d really like to make a plug suit. OO– KOS-MOS from Xenosaga episode I… There are so many armored pieces and these things attached to the skirt that looks like torpedoes… It was a lot of worbla/wonderﬂex… not to mention sewing upholstery vinyl (I wanted her to have a utility feel, and less costumey, because she is an android). SM– I’m going to go ahead and say it was June May from Cloth Road. I could only find one reference picture, and it didn’t show the back very well, which is where the majority of the design was. Cloth Road also isn’t cosplayed very much, so I pretty much had to make it up as I went, because there wasn’t really anyone else’s work that I could look at. Since it’s basically just a dress made out of flowers, I spent months researching flower types to try the ones I thought were in the picture, and then I wanted it to light up. It was ridiculous, and the skirt ended up weighing close to 20lbs by the time I was done. Both– Mostly upgrading and embellishing our WCS Fushigi Yuugi priestesses for ﬁnals. We’re currently working on ﬁnishing Tifa and re-vamping Terra from the Final Fantasy series, then next on the list are Love Live! idols, Wood and Flower Clow Cards from Card Captor Sakura, and Diao Chan and Sun Shang Xiang from Dynasty Warriors (from 6). SM– Oh! And revamping our Angelic Layer costumes. We really need some priorities, haha. SM– MORE NARUTO!! Making a new Sakura, and OoLaLa is going to be my Sasuke!! OO– Gwyndolyn from Odin Sphere. SM– I might someday, but I don’t see it in the foreseeable future. My to-do list keeps growing instead of shrinking. Both – Yes!! Sometimes we do! OO– I wore my KOS-MOS when I was in a few Mardi Gras parades with my radio station, and my Chun-Li costume to Wal-Mart after a midnight launch for Street Fighter IV. SM– I used to do this a bit when I was first getting into cosplay. I don’t really do it now, unless I’m a con, then I might not change before dinner or something like that, but I don’t dislike wearing my costumes in public, so I could do it. OO- We ALWAYS make them – that’s half the fun of it! SM- When I was first starting, I would buy a few pieces here and there and revamp them to my needs, but, yeah, we’re definitely in the position to make 99% of everything ourselves now. SM- I can think of two experiences off the top of my head where my approach to cosplaying has taken a dramatic turn. In college, an event happened that made me take a break from making costumes for a bit. I ended up diving back into cosplay very strongly after almost two years, and began focusing on making more elaborate costumes than I had before, and I haven’t stopped cosplaying since. The other event was back in 2009. I was suddenly diagnosed with Multiple Sclerosis. That has made my cosplay production move a lot slower, so I produce fewer costumes a year than I used to, and sometimes attend fewer events than I’d like to, but overall, I’ve managed to stay the same. OO- Watching panels at conventions has introduced me to new materials techniques that have improved my craft over the years, such as resin casting, worbla, wonderﬂex, and apoxie sculpt! Knowledge is POWER! SM– Reactions are definitely positive these days. We come from a generation where it wasn’t really the “in thing” to make alterations to a costume, but to make the most accurate version of the costume possible. We’re just finally getting into reinventions, and our friends are really supportive of our growth, and so is the community, which is currently being overwhelmed with reinvented characters. SM– Thankfully, the majority of the time, its positive attention, so that makes me really happy. I don’t really consider myself on the popular end, so when people notice my work, I get a little giddy. OO– It makes me really want to “be in character” even more, especially when you hear someone in the convention hallway calling you by your character’s name. OO– Quite a few people told me that the ﬂoral designs on my Terra cosplay from Final Fantasy were the most accurate and like the artwork. I strive for accuracy, especially with patterns and designs. SM– When Karmaluna cosplay gave me a hug when we placed in the WCS qualifier, and Emily whispered to me how proud she was of me. She’s really watched my performances grow over the years. Also, when I received Rynn’s judges award a few years ago for my Princess White Rose costume. It was a super special moment for me, because I always really admired her Princess White Rose costume, so it was super touching that she liked my work. Do you participate or have you participated in any cosplay contests (Convention, online, etc.)? SM– Yes. I participated on and off for most of my career, but since 2008-ish, I’ve been competing in cosplay contests pretty regularly. 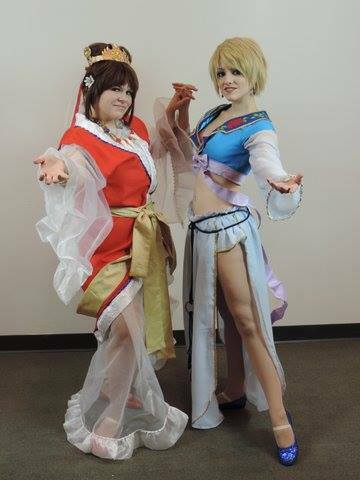 Fushigi Yuugi Group at World Cosplay Summit 2014 Qualifier at Anime St. Louis Photograph by Greg of Archon Masquerade. I received a judge’s award at IkkiCon 2012 for my KOS-MOS, at Coast Con 33 in Biloxi myself and the other MechaCon mascot won Best of Show, and even though I never entered it in a contest, my Terra from Final Fantasy VI was selected to be in a cosplay print calendar for my talent agency, Charisma +2 Models and Talent. SM– Numa Rei no Con in New Orleans, Louisiana back in 2002. It was a great free convention, but it stopped after Hurricane Katrina. OO– Mechacon 2005 in Lafayette, LA. SM– It doesn’t bother me at all! As long as everyone is enjoying themselves and giving credit where it’s due, it doesn’t matter, does it? I mean, cosplaying is for everyone, but sewing might not be. SM– As I get older, I find it a little harder for me to get in character for a whole weekend. If I’m in a group though, I’ll definitely go along with what others if they’re acting in character, or be in character for children, or something of the sort. I’m proud of the people who can stay in character all the time, I think I’m just turning an old lady. Haha. OO– I love to be in character. And I love it when others are in character as well. 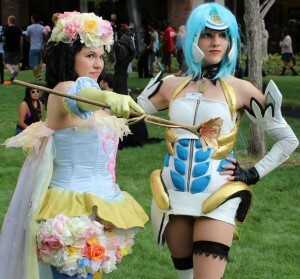 Unless they are cosplaying someone terribly rude or mean… Then perhaps being not in character is better. Is there anyone you’ve always wanted to meet and have a photo shoot with? SM– Beautiful photographers, come to me! I actually really admire Bryan Humphrey’s work. All of the cosplayers I admire, I’ve met, I just haven’t gotten a chance to have a photo shoot with them yet, but hopefully one day, our stars will align! OO– Gravity and science! Sometimes the real world doesn’t want to behave like anime physics, like hairstyles or weird ﬂoating ribbons… ya know? SM– I get really nervous when people want to give me constructive criticism on my work, even if I’ve requested it. However, I’ve realized over the years that you have to take everything people say with a grain of salt to your emotions. Sometimes, people have really great ideas that can really help you improve your craft, even if you chose not to implement it on the current project. OO– Learn everything you can at convention panels, ask other cosplayers questions. Like I said earlier – Knowledge is POWER! Don’t be afraid of asking for help. Real cosplayers give advice when asked. SM– And never give up! Everyone started somewhere. As long as you’re having fun, you’re doing it right! SM– I’m normally a pretty busy person, but I like to garden. I also like to draw, paint, or do anything creative. I love to write short stories in my spare time. I also recently started kayaking. SM – I have two dogs; a terrier mix named Dragonfly and a Siberian Husky named Meeka who love to be in everything. OO-I have a cat named Link (who is no help at all when making cosplays… he usually tries to eat my thread and elastic… grrr…) But then there is my boyfriend 🙂 He is very helpful. He’ll often pin things for me, or hold up costume parts while I attach stuff together for really complicated pieces. SM- Never give up on your dreams! For more from Cute Classy Cosplay, check out their social media below!